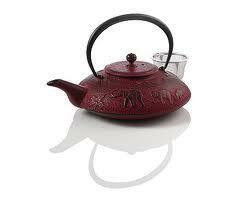 This elephant themed kettle comes with cast iron on the exterior and enamel on the interior to add to its durability. It comes with a strainer basket you can easily insert and remove when making your up to 40 oz. of tea. You can get it in either red or blue to add a spark to your kitchen.